You will now enter the main ‘Go Live’ screen that you use to work with. Tap on this field and you can choose the profile that you want to use from the ones you defined in LUCI Studio Setup. If you have chosen a shoutcast or icecast station you can type in the name of the ‘song-title’ that will appear in all of your listeners internet radio player. This is the level-meter of the outgoing signal on the internet. Including a peak-hold. This is the level-meter of the incoming return signal. Including a peak-hold and a little light with 3 states: off for no incoming signal, green for incoming signal without errors, red when a receiving error occurred. If you load a file for playing while broadcasting, its name will appear here. The length of the file that’s loaded for playing. The name that will be used when you make a recording. The length of the current recording in minutes:seconds. 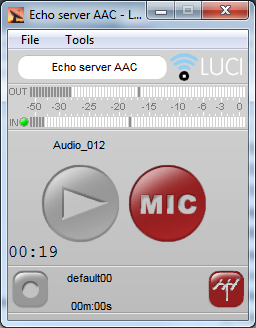 The big buttons are the ‘Play-button’ (shown in the OFF-state here) for playing a pre-recorded file and a ‘MIC-button’ to activate the Microphone (shown in the OFF-state here) or Audio-input. The smaller buttons are a ‘Record-button’ (shown in the OFF-state here also) to start recording and an ‘Antenna-button’ (shown in the OFF-state here) to connect to your radio-server or start listening for incoming connections. Press the ‘Antenna-button’. 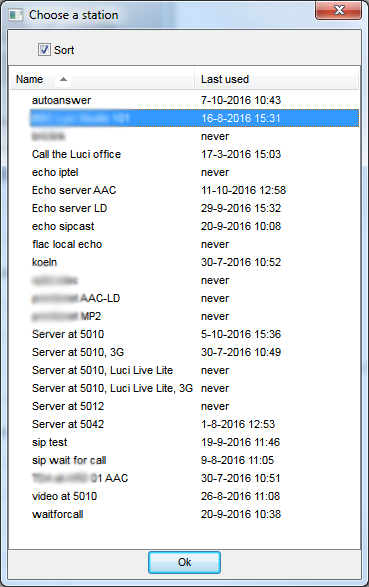 LUCI Studio will try to contact your server you have setup with LUCI Studio Setup or starts listening for incoming streams when the profile is setup to act as a server. While doing so, half of this button will flash until a connection is made, then the whole button will be lit. If no connection can be made, flashing will stop after a while and the button will not be lit (then try again and / or contact your program producer back at the radio station). Press the MIC-button to go live. You are now sending your Mic-signal to the server. The server will send a return audio signal back which causes the Input-light to become green indicating you have a valid return signal. You can now communicate with the studio. If you’re using the PC-version you can not move or close this window while you are connected. You must first stop the MIC- and Connect-button. This is a security protection against accidental mouse-clicks that might stop your transmission. If this profile is set-up to be a server it will only send a stream back when the MIC button is on. If you have predefined several station profiles in LUCI Studio setup, you can choose the menu-item Tools / Station. 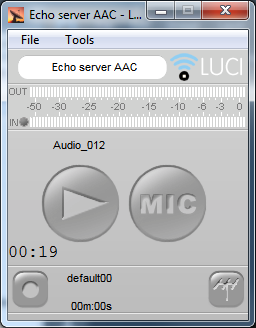 Alternatively, you can also click on the name of the station ( “Echo Server AAC” in the image above). But be sure you are not connected, otherwise you can not choose a new station. A small window appears with all stations in a list. Choose one and press OK to switch over to that station or just double click on one. You can also sort the stations according to the alphabet or the last time you were connected.